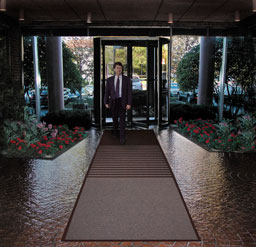 Learn about anti fatigue matting. 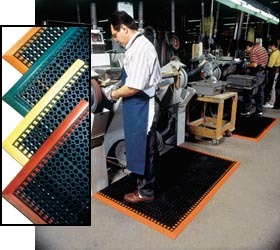 Anti fatigue mats are a necessity in any company where employees stand on their feet for many hours. 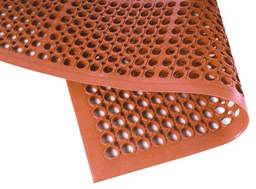 The hog heaven plush anti fatigue mat is one of the best anti fatigue mats we offer. As Ed mentioned, anti fatigue matting is a necessity. A customer may wonder why this is the case. Standing for several hours puts a lot of stress on a person’s feet. Without an anti fatigue mat, feet, legs, and backs will often start to ache. It can even leader to permanent injuries. If a employer cares about their employees at all this is all they need to know in order to purchase an anti fatigue mats. However, even if an employer doesn’t care about their employee’s well being, a happy employee is a better employee. They are more productive. This is because with anti fatigue matting employees do not have the overbearing distraction of pain. Anti fatigue mats saves in the long run. If a customer is still not convinced, an employee could possible sue for damages to feet and back if an employer doesn’t supply an anti fatigue mat. 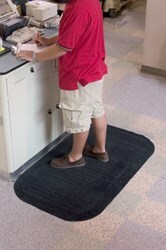 As mentioned, today’s product of the day is the hog heaven plush anti fatigue mat. This product is in stock in five different beautiful colors. These colors include navy spice, cinnamon, confetti grey, forest green, and brandywine. This product is designed for ultimate comfort without the industrial rubber look. The product also is slip resistant. The thickness is 5/8 inches 0r 7/8 inches for extra comfort. This product is shown to the right. Customers should consider ordering this product today.